Home » STRATEGY TRADING » TRADING BINARY » What is the Definition of Market Bullish, Bearish and Sideways? What is the Definition of Market Bullish, Bearish and Sideways? What is the Definition of Market Bullish, Bearish and Sideways? - For those who have been playing trading for a long time, of course, they are familiar with the terms Bullish, Bearish and Sideways. Then what about those who have just jumped into the world of trading, okay to explain more, please read this article to completion. Bullish is taken from the word Bull which means bull. That is when the market is experiencing an increase, meaning bull (bull) or buyer is playing a role. When a bull or a buyer is in control of the market, that's when it's called a bullish market. Bullish features are the formation of very high mountains with long green candles. It is suitable for OP upwards. Bearish is taken from the word Bear which means bear, that is when the market is experiencing a decline, meaning that bears (bears) are in control of the market, well that's when the market is said to be bearish. Bearish characteristics are the formation of very deep valleys with long red candles. It is suitable for the OP to go down or get ready for OP up because usually the market will rise again after experiencing a decline. Sideways are conditions where the market is flat, where there is doubt in the market. Bulls (buyers) and bears (sellers) are both strong, resulting in flat prices. The characteristics of Sideways are the formation of small mountains and shallow valleys with green candles and reds in the form of short, stable market movements also not too up nor too down. Usually in these conditions it is very suitable to use trading robots because they quickly get profit. Bull is a buyer, the opposite is Bear (bear) is a seller, when the number of buyers is more than the seller. can also be concluded when it is called Bullish market. 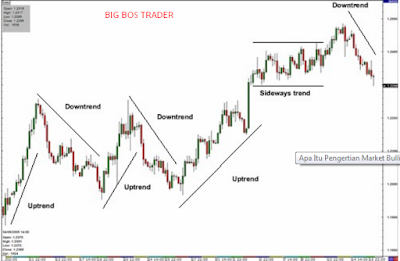 in terms of bullish market forex is often also called the UpTrend Market. Where the base currency increases in value, while the currency pair decreases in value, while the bearish market is often also referred to as the DownTrend Market, where the seller is controlling the market. 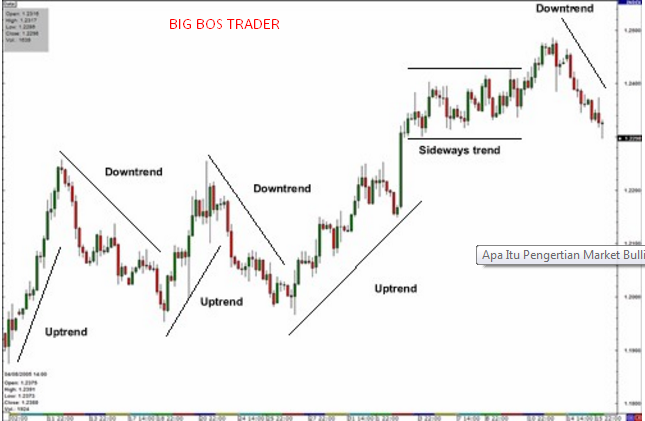 If both are equally strong both sellers and buyers are often also called No Trend Market. That's all I can say about a little explanation about What Is Understanding Market Bullish, Bearish and Sideways ?, hopefully it can be understood and greetings of success for all of us. 0 Response to "What is the Definition of Market Bullish, Bearish and Sideways?"